Interior Finishes & Fittings for Historic Building Conservation complements Materials & Skills for Historic Building Conservation, combining the history and application of each material with current knowledge of maintenance and conservation techniques. Of direct practical application in the field, it takes the reader through the process of conserving historic interior finishes, covering everything from decorative plasterwork, joinery and paint colour; to chimneypieces, lighting and fire safety management. The series is particularly aimed at construction professionals – architects, decorative arts historians and specifiers, surveyors, engineers – as well as postgraduate building conservation students and undergraduate architects and surveyors as specialist or optional course reading. The series is also of value to other professional groups such as commissioning client bodies, managers and advisors, and interested individuals involved in house refurbishment or setting up a building preservation trust. While there is a focus on UK practice, most of the content is of relevance overseas (just as UK conservation courses attract many overseas students, for example from India, China, Australia and the USA). The chapters are written by leading conservators, historians, architects, and related professionals, who together reflect the interdisciplinary nature of conservation work. 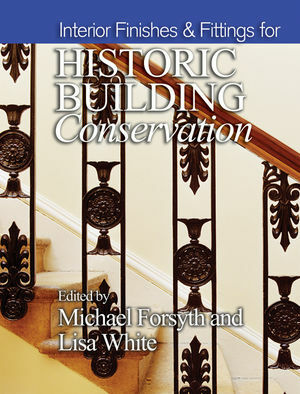 While substantial publications exist on each of the subject areas - some by the authors of the Historic Building Conservation series - few individuals and practices have ready access to all of these or the time to read them in detail. The aim of the series is to introduce each aspect of conservation and to provide concise, basic and up-to-date knowledge within four volumes, sufficient for the professional to appreciate the subject better and to know where to seek further help. Michael Graham de Jong Forsyth, Director of Studies in Conservation of Historic Buildings, University of Bath.